Aged German is given 48 hours to leave city! This article published in the Topeka Journal covers the story of Daniel Klege. Klege, a 75 year old resident of Topeka, Kansas, and veteran of the Civil War, was ordered to leave Topeka until the end of the war with Germany because he had never registered to become a naturalized U.S. citizen. An oral interview with Alexander Braun conducted by Sara Keckeisen. He was born July 10, 1923 in Wernersdorf the Ukraine the son of Peter and Katharina (Braeul) Braun. After World War II, Mr. Braun fled west from the former Soviet Union. Eventually he immigrated to Canada (1949) on contract with the Canadian Government to work as a miner in Northern Quebec. After years of persistent attempts, in 1953 he was able to come to the United States from Kitchener, Ontario, Canada, to join his wife and her parents in Kansas. Alexander worked in auto body repair. He later was employed by the Kansas Neurological Institute (KNI) and the State of Kansas as a Master Electrician before his retirement in 1991. These are long clips. The first clip is sixty-three minutes, the second is seventy-three minutes. A searchable transcription of the interview is available by clicking on Text Version below. This Alien registration Card, issued by the U.S. Department of Justice to Vena Peters Schock of Topeka, KS, was issued during World War I due to Schock's status as a non-naturalized citizen of the United States. During World War I many German Americans were issued similar registration cards that they had to carry at all times. If a non-naturalized German American was stopped without their card, they could face imprisonment until hostilities between Germany and the United States ceased. This article, published in the June 19, 1917, edition of the Topeka Capital addresses the law prohibiting German immigrants who were not naturalized U.S. citizens from entering the Topeka Business District without a special permit from the U.S. Marshall Office. Anyone violating the law could be placed in jail without trial until the end of the war. This is a photograph showing Andrew A. Henry and Mary Gudenkauf Zind Henry on their wedding day. Andrew A. Henry was born in Bavaria, Germany on December 31, 1860, and his parents were George Heinrich Henry and Eliza (Iva) Dougle Henry. Andrew immigrated to the United States in 1881 at the age of 21 and settled in Kingman County, Kansas. He worked for the railway company in Kingman for a few years before coming to Nemaha County in 1893 where he settled on a farm near Goff, Kansas. In 1896, he married Mary Gudenkauf Zind at Sts. Peter and Paul Church in Seneca, Kansas. They had six children Frank, Antone, Leo, Catherine, Joseph, Bernard and Clemens Zind, Mary's son from a previous marriage. On September 18, 1910, Mary died of peritonitis. On January 21, 1914, Henry married Josephine Dreier and they had one son Vincent. In 1924, Andrew and Josephine moved from the farm to a home in Seneca, Kansas. Andrew Henry passed away December 12, 1947. Mary Gudenkauf Zind was born November 14, 1869 in Minster, Auglaize County, Ohio and her parents were Henry Clemens and Maria Catherine Barhorst Gudenkauf. Mary's parents moved to Seneca, Kansas in 1886 after their flour mill was destroyed by a fire. In 1890, Mary married Antone Zind, and they had two children Margarite (who died at the age of 2) and Clemens. Antone Zind died in an accident on a farm just east of Seneca on August 29, 1893, at age 31. This illustration by cartoonist Thomas Nast was published in Harper's Weekly. It depicts a potential Exoduster being questioned by a watchful Irishman with the caption "An' what right have you, sure, to be afther laving your native place an' coming here? Spake!" In the background a sign reads "Free Soil Kansas". Parfleches, like this one, were generally made of a dried buffalo hide that had been stretched and shaped to form a bag or container. This parfleche, donated to the Kansas Historical Society, was made for Antoine or Antonine Barada, 1807-1885, son of an Omaha mother and a French-American fur trapper and interpreter. Barada was something of a local folk hero in Nebraska, credited with feats of strength. The parfleche is decorated with a painted red, black and yellow geometric pattern on the front and back. The inner closure flap has "A. Barada 1861" in pencil. The seams are sewn with sinew. This is a three-page autobiography of Louis Palenske, written on his 76th birthday. The fourth page is a short autobiographical synopsis. Funded by the National Historical Publications and Records Commission through the Kansas State Historical Records Advisory Board. This complete bottle was recovered during excavations in 2014 of the Adair cabin site, home of Reverend Samuel and Florella Brown Adair and their family, in Osawatomie, Kansas. Osawatomie and the Adairs were much involved with the abolitionist movement during the "Bleeding Kansas" years. The clear glass bottle may have once held shoe polish. Embossed on the front and back panels is the advertising "B. F. STINSON & CO BUFFALO, N.Y. U.S.A."
Bastille Day celebration held in Barker's Park, north of Florence, Kansas, July 14, 1884. This photograph was copied from the Kansas Historical Quarterly, Volume XIX, 1951, pg. 192-193. 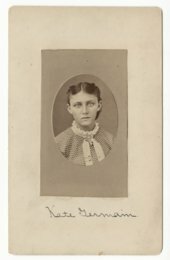 This short biography of Frederich and Caroline Palenske was written by their son, Louis Palenske, born in the Kansas Territory in 1858. The Palenske family immigrated from Germany to the United States in 1854, and soon homesteaded a claim in Richardson County, Kansas Territory. Funded by the National Historical Publications and Records Commission through the Kansas State Historical Records Advisory Board. This metric book or birth, marriage and death register is a bound volume with a missing spine. The register contains birth, death and marriage records for the Holy Trinity Russian Orthodox Church members for the years 1922-1966. The volume also contains 35 records kept on loose paper. Funded by the National Historical Publications and Records Commission through the Kansas State Historical Records Advisory Board. This Metric Book is a volume with records of births, marriages and deaths of the church members for the years 1917-1923. The pages of the volume are printed on original paper with Russian Imperial insignia and Old Church Slavonic language titles and headings. There are no binding, covers, endsheets or any evidence that they existed at any point in time. The register is a compilation of signatures and is arranged in chronological order by year and by the event of birth, marriage or death. The volume also contains loose pages with metric records. Funded by the National Historical Publications and Records Commission through the Kansas State Historical Records Advisory Board. Tom Pratt boating on his farm pond near Studley, Kansas, 1895. This photograph shows members of the Bohemian Athletic Club (Sokol) from Wilson, Kansas. The sokol was a Czechoslovakian organization that promoted physical and intellectual activities within the Slavic community of Wilson. This bowl or sauce dish was recovered during excavations in 2014 of the Adair cabin site, home of Reverend Samuel and Florella Brown Adair and their family, in Osawatomie, Kansas. Osawatomie and the Adairs were much involved with the abolitionist movement during the "Bleeding Kansas" years. The ten sherds were refit after the excavation. The bowl has a gray and pink floral motif with a silver band around the rim. These five butter pats were recovered from the Grinter House in Wyandotte County. Butter pats are often mistaken for children's toy dishes, but they are meant to hold individual servings of butter. These were made by Haviland and Co., of Limoges, France. The Grinter House is a two-story brick home overlooking the Delaware Crossing on the Kansas River, and is in the National Register of Historic Places. Moses and Annie Grinter (she was a Lenape Delaware) owned and operated a ferry and trading post there. Grinter Place was added to the National Register of Historic Places in 1971. These four buttons were collected from a multicomponent site overlooking the Missouri River in Leavenworth County. The site, with occupations in the Middle Ceramic and Historic periods, may have once been a Kickapoo habitation site in addition to later habitations. The buttons include a ladies dress button made of jet with a linear design and a loop or shank back; a metal four-hole sew through button, likely for pants; a white china four-hole dish button; and a wooden recessed four-hole sew through button. These five buttons were just a few of those recovered during excavations in 2014 of the Adair cabin site, home of Reverend Samuel and Florella Brown Adair and their family, in Osawatomie, Kansas. Osawatomie and the Adairs were much involved with the abolitionist movement during the "Bleeding Kansas" years. The buttons include a handmade wooden five-hole button with offset holes, two shell 4-hole buttons, a china 4-hole button, and a china 2-hole button. The four white buttons were likely used on shirts, waistcoats, underwear, or for children's clothing. The larger wooden button could have been used for trousers, jackets, and some dresses.